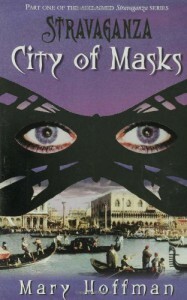 City of Masks is the story of fifteen year old cancer patient, Lucien who has the power to use his magical time traveling notebook to enter a parallel universe when he sleeps. There, he becomes Luciano in sixteenth century pseudo-Venice in a city called Bellazza where he finds adventures, new friends, political intrigue, and hope for a cancer free life. Laced into the story are also beautiful descriptions of the city and the lives of the people who live there. All in all, this is a great interesting read for young readers.